I'm not registered and need to create or join a team during my registration process. I'm already registered and need to create, join or change my team. During Registration: How do I create a team? 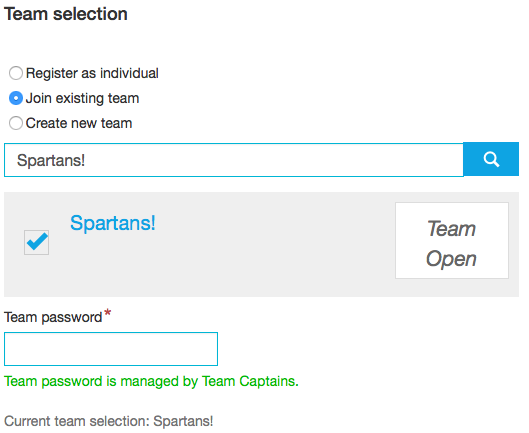 After filling out your personal information and agreeing to the waiver, you'll arrive on the "Team Selection" page. Select the "Create new team" option. Then, enter your team name into the box. Then continue onto the next step of the registration process. As soon as you finish registering by checking out, the team will be created. You are now the captain of a team. Your friends can join your team during their registration process. During Registration: How do I join an existing team? Entering all or part of the name will bring up a list of team names below the search bar. Then, check the box beside your team name. If your team requires a password to join, you'll need to enter it now. Then, click the "Next" button to continue onto the next step of the registration process. As soon as you are done with the registration process, you'll be counted as a team member. 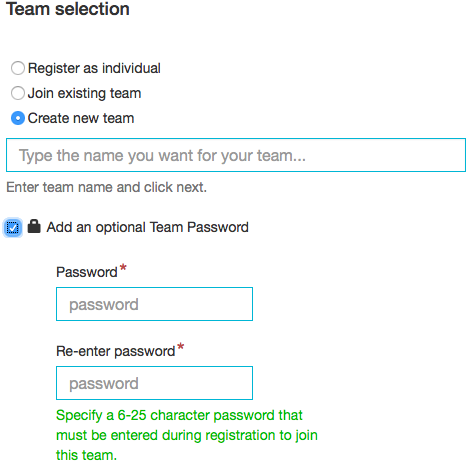 After Registration: How do I Create, Join or Change a team? 1) Log into your Chronotrack Account as you normally would. See link below for help. - How do I log into my Chronotrack Account? 2) Once in your profile you will see the events tab. Select upcoming events. 3) Once you select the specific event, you will see the following tabs on the right side. 4) To join an existing team, please select Join Team. - Use the search bar and find your team name. Enter password (if applicable). 5) To create a new team, please select Create Team or Create New Team. - Enter your requested team name and password if needed. Password not required. 6) To change to a different team, please select Change Team. - Just use search box to find your new team. Then submit. * Please note, all athletes who wish to have the same start time must be in the same session, (elite, competitive, morning or afternoon). * Please note that all team adjustments must be made at least 15 days before the event. How does the Team Ranking work? Can I Use The Spartan Logo On My Own Gear?